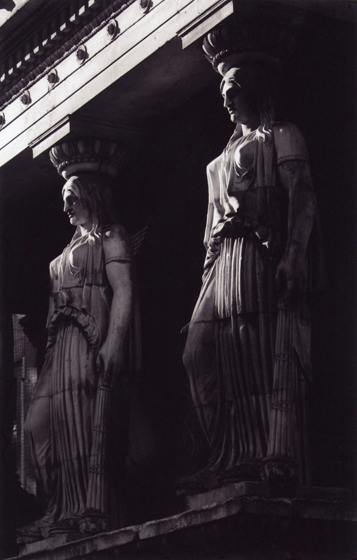 Caryatids, St. Pancras New Church, Euston. Photo © David Secombe, 2010. St. Pancras is the queen of early nineteenth century churches; its architecture earns it the title, as much as its size and cost. Inwood’s flair for recapturing that nervous intensity of Greek architecture of the fifth century is very remarkable, and he seems to have had no difficulty in applying it to the commonplace objects of English practice. The church stands on the corner of the Euston Road and Upper Woburn Place . It was consecrated in 1822, and was the most expensive church of its time – it was, in fact, the most expensive church in London since St. Paul’s. The father and son team of William and Henry Inwood won the competition to design the building and produced a church in the Greek revival manner, complete with a pair of pavilions modelled on the Acropolis’ Temple of the Erectheum. (Henry Inwood had travelled much in Greece and is generally considered to have been the dominant force in the design of the building.) The terracotta caryatids that guard the crypt are a clear echo of their ancient Greek forbears – one of which resides at the British Museum, part of that long-contested group known collectively as the Elgin Marbles. On July 7 2005, a suicide bomber detonated a bomb on board a number 30 bus which had just passed the church, proceeding down Upper Woburn Place before its destruction in Tavistock Square. The steps of St. Pancras were one of the sites for floral memorials to mark the tragedy.